Horizontal sliding window prices will run $225 to $750 fully installed for a normal sized opening. (larger sliders can certainly be more expensive). Find cost estimates and recommended manufacturers at several different price points. Horizontal sliders open by sliding one of the window panes sideways along a fixed track, thereby allowing half of the glass area to be opened. Sliding windows do not offer the best energy efficiency option as say a double or single hung window ( and typically not quite as expensive), but are great options for bedroom window where you want lots of light and an easy way to open them up for ventilation. Entry level sliding windows are usually offered in a lower to mid ranged vinyl frame and you can get them at many retail stores including Home Depot or Lowes. While you may be limited on the features and color options available when buying entry level replacement windows, you may be offered glass with a fill but a higher U and R value. The standard options often come with a choice of frame materials including uPVC, higher quality vinyl or composite. In the majority of cases you will also be offered a low-E glass with an argon fill in a double pane. Higher end sliding windows come two frame options, you can choose from the wooden interior with fiberglass exterior cladding or the wood option. These windows are usually offered by the higher end manufacturers and in some cases the middle ranged manufacturers. Either way you will still be offered triple or double paned glass that is foam insulated, highly energy efficient and filled. Sliding windows prices for installation range from $40 to $250 per window. These prices are determined by the amount of work required. As you can imagine a simple replacement will cost a minimal amount for installation while a larger job that requires sill and trim replacement and opening changes will cost considerably more. For additional pricing info, try our window replacement cost estimator. Buget window costs for sliders start at $115 and top out at $300 for each installed window. 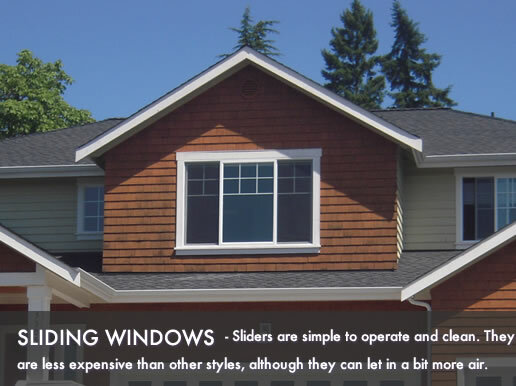 mid range windows costs for sliders start at $300 and top out at $500 for each installed window. High end windows costs for sldiers start at $500 and top out at $750 for each installed window.